A sequence of four large earthquakes hit the New Madrid Fault Zone in December 1811 and January and February 1812, shaking the eastern United States in events that observers said made the Missouri River run backwards. Those earthquakes have remained mysterious for the past two centuries. Using reconstructions of felt groundshaking and modern measurements of recent seismicity, researchers have honed in on estimates of the sizes  between magnitudes 7 and 8  and epicenters of the quakes. However, new research has moved one of those earthquakes off the New Madrid faults, possibly changing the hazard conditions for the region and highlighting the potential for far-off large earthquakes to trigger other earthquakes across the eastern United States. This shake map illustrates what the first New Madrid earthquake on Dec. 16, 1811, felt like. 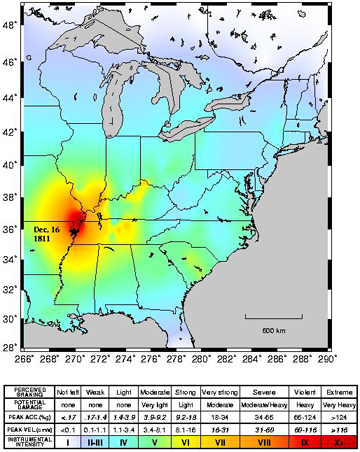 Researchers relocated one of the four main shocks far away from the New Madrid fault zone. Image courtesy of Susan Hough, U.S. Geological Survey, Pasadena, Calif. In a paper in the May 20 Nature, seismologists document modeling of the stress regime along the observed and presumed faults that compose the New Madrid Fault Zone. Karl Mueller of the University of Colorado at Boulder and his co-authors collected recent microseismicity  which they assumed to be tiny aftershocks that continue from the 1811-1812 events  to map stress changes. They then used historic data and those modern events to create models of the four-earthquake series. The team further established that three of the events  not including the third earthquake  were like dominoes falling, with each triggering the next, Mueller says. Mueller calls the third event of the four "the most enigmatic." Trenching and other geologic field work in the area north of the New Madrid zone's Reelfoot Lake in western Tennessee show that the region did not rupture during that particular earthquake, he says. Also, the third event "simply doesn't fit any model" of stress distribution for the region, according to the principles of stress transfer, he says. "If anything, that earthquake should have been inhibited by any earthquakes that came before," he says, which would have relieved some of the local stresses. "It was unlikely to have happened in the main New Madrid zone." The team hypothesized that the third earthquake happened far away from New Madrid, triggering the current aftershocks in that unruptured area, though where the epicenter was remains unclear. Mueller says that co-author Sue Hough of the U.S. Geological Survey (USGS) in Pasadena field-checked a historic account from the time period by a person named Yearby Land, describing sandblows 220 kilometers away from the New Madrid faults. Land told of a large crack opening and "piles and piles of pure, snow white sand [that] were heaved up," some as big as "several wagon loads"  though Land does not mention an earthquake associated with the liquefaction. The authors argue that if their modeled epicenter for the second event is correct, then the hazard for large earthquakes triggering others from hundreds of kilometers away is greater than previously thought across the eastern half of the United States. Mueller notes that glacial rebound for the area is still occurring, and those gradual changes in stresses may have an effect. There may be "other faults lurking," he says, that are too small to detect or have not ruptured in historic time and are not outlined by aftershock sequences. Joan Gomberg, who studies these kinds of far-reaching teleconnections as a seismologist at the USGS Center for Earthquake Research and Information at the University of Memphis, says the new scenario is "certainly possible" but not "definitive." In cases where far-reaching triggering is obvious, such as the Denali earthquake in 2002 or the Southern California Landers earthquake in 1992, "we don't have this 200-year gap," she says. "We can see immediately after an earthquake what happened next and where." The New Madrid evidence suggests such triggering, she says, "but it's all circumstantial." Other geologists also note that the liquefaction evidence needs to be substantiated with further work. Shifting the January event from the northern end of the New Madrid seismic zone to southern Illinois or western Kentucky "would have implications for that region" with regard to local hazards, says Art Frankel of USGS in Denver, Colo. However, he continues, that "doesn't change that there's high hazard in the New Madrid area." Very large earthquakes in addition to the 1811-1812 events, in both A.D. 900 and 1450, further underscore the hazard. "That story hasn't changed," Frankel says. However, the geographic shift in the second earthquake is important to note, he says, and "hard to quantify in a hazard assessment. That remains an active research area."